Lots 1-3 are white; Lot 4 is unknown. From the Hancock County Courthouse, go east two blocks on Broad St to Boland St. Turn right on Boland, which becomes Linton Road, and travel 13.5 miles (bearing right on Beulah Hwy after 8-1/2 miles) to Underwood Rd. Turn left. Cemetery is 0.3 mile down Underwood Rd., on the left behind a locked gate. This is a private homesite which is restricted to access from anyone but family members. Ask permission. On same gravestone as Maye M. Ray. On same gravestone as George D. Ray. "He followed virtue as his truest guide. Lived as a Christian, as a Christian died." "You are not dead to us but as a bright star unseen absent from the body and present with the Lord." s/o Dr. R. L. and Katie H. Ray. s/o Willie Joe and Mabel Hitchcock Ray. "Oh! How meek, generous and true, He bore his trials and pleasure thru." "A tender mother and a faithful friend." Farewell, O husband dear, Thoust left me lonely in this world of pain. O! May we meet in heavenly bliss to dwell at God's right hand, no more to part again. Many fond hopes we buried here. On large marker with Eunice McRae Ray. w/o A. L. Ray, m/o James A. Ray. On large gravestone with James A. Ray. 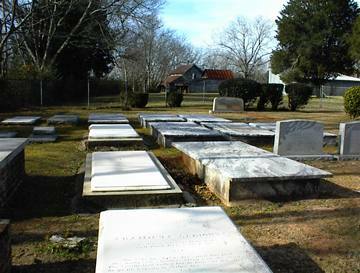 A large tomb believed to contain Levi Speights and his wife. See also Houses of Hancock, pp. 209-210, by John Rozier. Speights bought house here Nov. 2, 1835. Identity per A. J. Parker. This lot is overgown with heavy brush and large trees. There may be as many as 20-30 graves. It may be that these graves hold Black workers who worked for the Rays. Last name difficult to read. Last name per Kimbrough list. First name difficult to read. First name per Kimbrough list. 2 headstones with no inscription. "Miss" Missing in 2001 survey. Info per Kimbrough list.